Posted on October 21, 2015 by Al B. The first of many good news articles for the north coast of British Columbia, but with concerns still alive about tanker traffic increases in the Straits and Salish Sea, especially around the San Juans. This battle is not over yet, but at least a favorable government to ending it is now coming to power. Posted on October 1, 2015 by Al B. Good news that a more precise count on species has been completed. Will be good for future monitoring efforts. Coho salmon, Pacific halibut and even the dogfish shark are familiar faces to many people in the Salish Sea region. But what about the Pacific viperfish, northern flashlightfish, dwarf wrymouth or the longsnout prickleback? These colorfully named species and others are compiled in a new, 106-page report that documents all of the fishes that live in the Salish Sea, a roughly 6,500-square-mile region that encompasses Puget Sound, the Strait of Juan de Fuca, the Strait of Georgia, the San Juan Islands and the Canadian Gulf Islands. In total, 253 fish species have been recorded in the Salish Sea, and that’s about 14 percent more than in the last count, said Ted Pietsch, co-author of the new report and a University of Washington emeritus professor of aquatic and fishery sciences. Posted on August 13, 2015 by Al B. The boats used to haul up the derelict nets deliver the speakers to the celebration. Some of faces of the celebration. Thursday in Everett, the Northwest Straits Initiative celebrated the culmination of it’s shallow water derelict net removal project. It’s been a great project and they hope to eventually get funding to go after the deep water nets next. But the numbers below are really impressive. The takeaways from today’s celebration was how politicians of both sides of the aisle actually came together to fund this project. Furthermore, both Republicans and Democrats who spoke, including Senator Patty Murray, hailed the fact that this is an environmental project that actually accomplished what it set out to do. 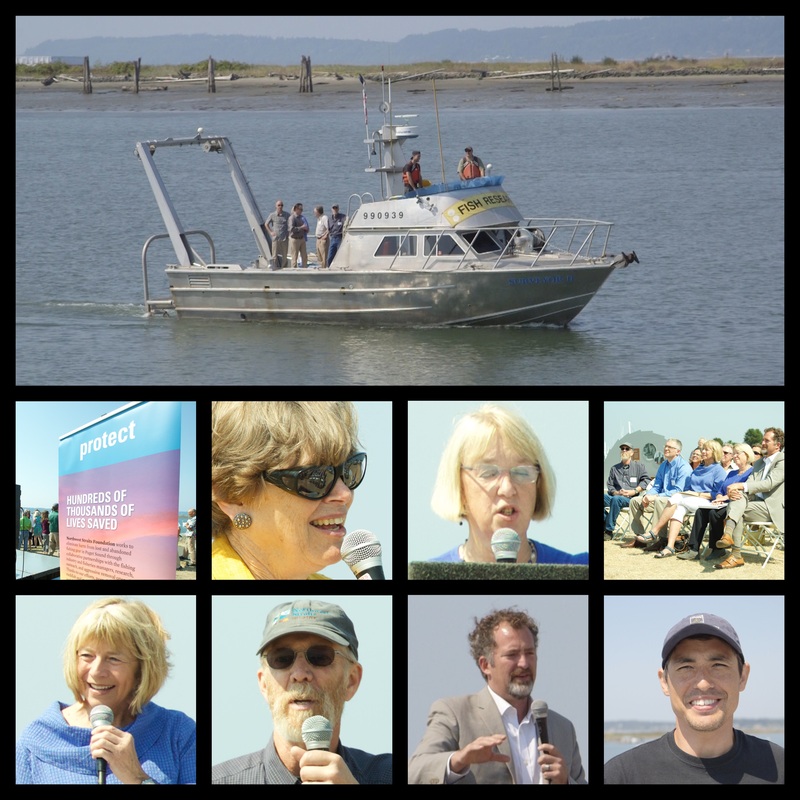 The Northwest Straits fund our local Marine Resources Committee, which has established the eel grass protection zones in Port Townsend Bay, and helped implement and monitor shellfish protection zones in Mystery Bay and Lower Hadlock. The Northwest Straits Initiative identified the problem of lost and abandoned (derelict) fishing gear in Puget Sound in 2001 and began removing this gear in 2002. Through the years, the program (now managed by the Northwest Straits Foundation) has combined aggressive removal operations with research and prevention outreach to combat this problem on all fronts. The simple goal is to eliminate harm from derelict fishing gear in Puget Sound. Over the course of 13 years, the program has evolved into a national model of how to effectively address this problem. June 30, 2015 marked the culmination of the removal of shallow (to 105’) water legacy derelict nets in Puget Sound. 5,667 nets have been removed, recovering 812 acres of marine habitat and protecting from entanglement thousands of animals every year. This represents 94% of the estimated 6,000 nets lost over decades. This marks a major milestone in the recovery of Puget Sound. The removed nets contained over 450,000 entangled animals representing over 260 unique species, including 65 mammals, 1,092 birds, and 5,659 fish. Animals caught and killed in the gear include porpoises, seals, otters, diving birds like pigeon guillemots and cormorants, sharks, salmon, crabs, and octopus. Removing 5,667 nets has protected more than 1,700 mammals, 28,000 birds, 110,000 fish, and over 4.4 million marine organisms in total, from entanglement in derelict gear annually. More information about this effort can be found at www.derelictgear.org. Because of this net removal work, porpoises, diving birds, and fish can now swim and dive in Puget Sound without the risk of being entangled in derelict fishing nets. They now have free access to over 800 acres of marine habitat formally covered by dangerous derelict fishing nets. In Puget Sound, derelict fishing nets were identified as a stressor on ESA listed marbled murrelets, salmon, and rockfish. Culmination of this work marks the successful completion of Near Term Action B3.2.1 in the 2014 Puget Sound Action Agenda, the comprehensive plan designed to clean up Puget Sound by 2020. This work was supported by literally dozens of organizations and thousands of individuals over the years. Its final funding was supported by a bipartisan team of state legislators working across the aisle to solve this seemingly daunting problem. The Northwest Straits Foundation is now working in collaboration with the fishing industry and fisheries co-managers to ensure that newly lost nets do not become. It is also developing methods to remove derelict fishing nets from deeper water and addressing the problem of derelict shellfish pots. The Northwest Straits Foundation is the non-profit partner of the Northwest Straits Initiative, a collaborative model for marine conservation with a vision of diverse communities working together to restore a thriving marine ecosystem in the Northwest Straits of the Salish Sea. The Foundation works in partnership with the Northwest Straits Commission and seven local Marine Resources Committees (MRCs) of the Northwest Straits whose members represent the diverse stakeholders of their communities, and who identify and implement local marine conservation and restoration projects in their communities. Northwest Straits Foundation works with the MRCS to develop projects and attain funding support, as well as implement regional restoration and education programs, including its internationally-recognized Derelict Gear Removal Program. See www.nwstraitsfoundation.orgfor more information. This week the organization is celebrating the removal of 5,667 such nets, a feat it calls a “major milestone in the recovery of Puget Sound,” according to a news release. The foundation has removed 94 percent of about 6,000 nets reported as lost in Puget Sound.